Made by Howard Earle Coffin at a cost of $400 in 1901. This is a two-cylinder car with a pilot light, boiler, and a chain drive. This car, the only surviving example, was once in the Henry Ford Museum. It was purchased by Feltz Terrill, a local peanut farmer in De Leon Texas. Visit this car at the Terrill Antique Car Museum at 500 N. Texas Street, De Deon, TX 76444 254) 893-3773. Howard Coffin went on to work for Hudson, where he designed, among other cars, the Hudson Light Six-40 Phaeton. John Conde, the Henry Ford Museum's Curator of Transportation, assembled an important file of information on the Coffin Steam Carriage. 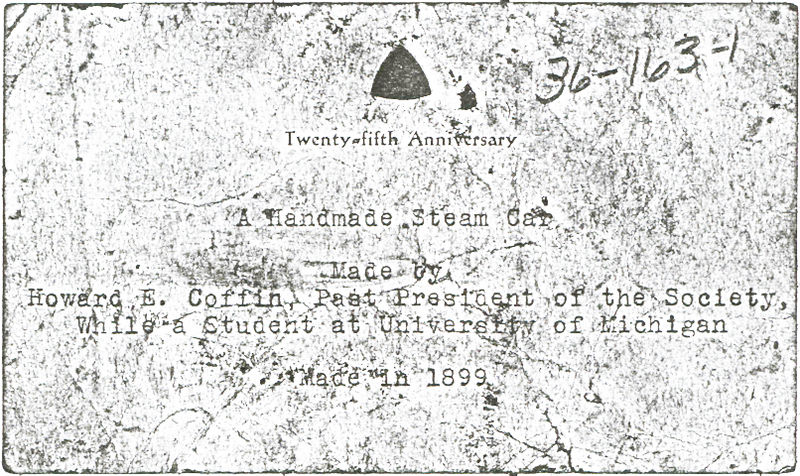 Click here to read John A. Conde's information on Howard E. Coffin's Steam Carriage. John A. Conde Collection. 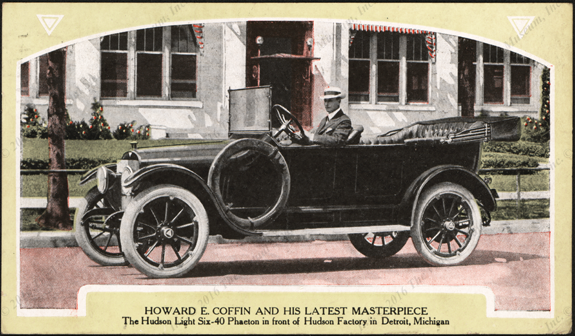 Howard Coffin posed for this postcard in front of the Hudson Factory in Detroit, MI. 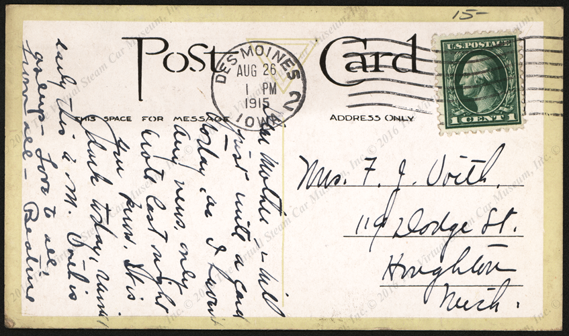 This postcard carries an August 26, 1925 postmark. 2009 Terrill Antique Car Museum Brochure. Contact us if you have additional information about the Coffin Steam Carriage, or if you have questions.